HONG KONG — Chinese authorities and Airbus are investigating why a plane's windshield blew out midflight, forcing an emergency landing, in an unusual mishap for a country with a booming aviation market and exemplary air safety record. Sichuan Airlines flight 8633 was en route from Chongqing, China, to Lhasa, Tibet, on Monday morning when the A319 jet's cockpit window jet flew off, the country's aviation regulator said. The pilot made a white-knuckle descent to Chengdu, China as the co-pilot was nearly sucked out of the plane, saved only by his seatbelt. Chinese internet users praised the pilot's levelheaded response during the harrowing incident but also wanted to know what caused it. Losing a windshield midflight "is an incredibly rare event," said Geoffrey Thomas, the Australia-based editor in chief of safety website Airlineratings.com. "You get cracks in windshields from time to time, but certainly they're designed to be failsafe and this is not supposed to happen." The incident does not detract from China's overall safety record, which rivals that of more advanced countries, he said. 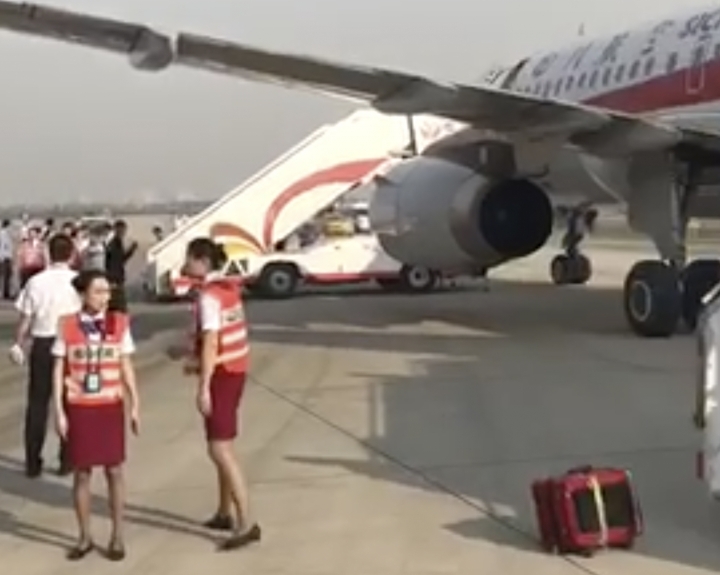 The plane took off at 6:27 a.m. and climbed to 9,800 meters (32,000 feet) when its right-hand windshield "suddenly burst and fell off, causing the cabin to lose pressure and passenger oxygen masks to drop," the Civil Aviation Administration of China said in a statement on its website. "There was no sign before the windshield burst. Just a huge noise," Captain Liu Chuanjian told the newspaper Chengdu Economic Daily. Looking across the cockpit, Liu saw the co-pilot "partially hanging out of the window. Fortunately, he had his seatbelt on." Some cockpit equipment was damaged, the CAAC said. Photos posted on Chinese social media showed an control panel partially torn away from the dashboard. 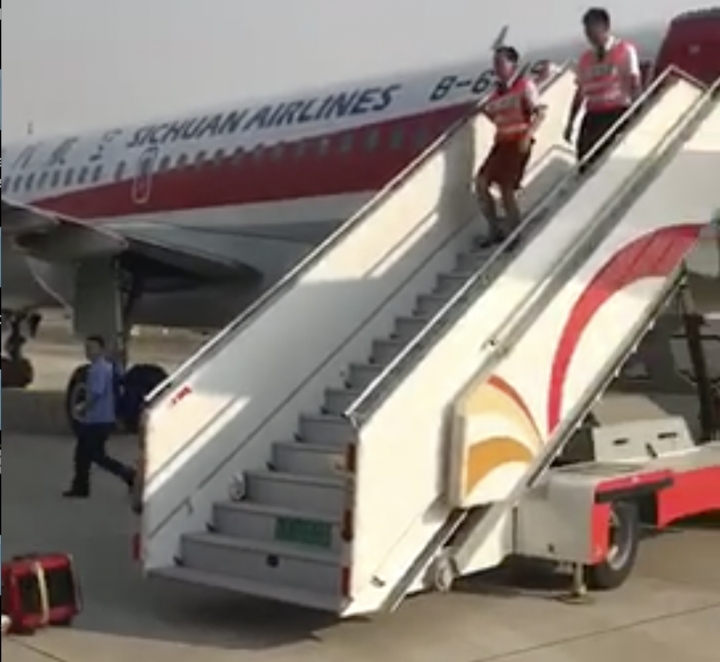 The co-pilot suffered scratches, a flight attendant's waist was hurt, and 27 of the 119 passengers were injured, according to a post from Sichuan Airlines on Sina Weibo, China's version of Twitter. Airbus said Tuesday it has assigned a team to investigate and will cooperate with Chinese authorities. CAAC said that the Airbus jet began service on July 26, 2011 and its windshield had no record of defects and had not undergone any maintenance or been replaced before the accident. Airbus said the aircraft had logged 19,942 flight hours. In 1990, an improperly installed windshield on a British Airways jetliner blew out at about 17,300 feet (5,300 meters) after it took off from Birmingham's airport. The captain was sucked halfway out the BAC 1-11's window but survived because cabin crew held on to his legs while the co-pilot made an emergency landing. An accident report said the windshield was replaced before the flight with the wrong size bolts. Earlier this year, a Southwest Airlines jet's passenger window shattered when it was hit by debris from an exploding engine, killing one passenger. China's air safety record improved dramatically after a string of fatal accidents in the 1980s and early 1990s as authorities focused on making improvements. Now, China's airlines have a "superb record" and the country is "considered an extremely safe place" for air travel, Thomas said. China's most recent fatal plane disaster was a military aircraft crash that killed 12 in January. But the country hasn't had a fatal accident involving a scheduled commercial jetliner flight since 2010, when 44 people were killed in an Embraer jet crash in northeast Heilongjiang province, according to the Aviation Safety Network database. Copyright © 2015 - 2019 Asean Coverage. All Rights Reserved.